Owned and operated by the Archdiocese of Los Angeles and named in honor of Joseph Sadoc Alemany, O.P., Bishop Alemany High School, like the man, has had the “desire to be of service” as its hallmark from the beginning. The opening of the new Bishop Alemany High School on the Rinaldi campus in 1956 transformed the seniors of 1956-1957 into Alemany's first graduates. For the purpose of attracting a greater variety of students, His Eminence James Francis Cardinal McIntyre changed not only the name, but also the status of Saint Ferdinand High School by making it co-instructional (i.e., having non-integrated boys and girls sections). In 1956, the new Bishop Alemany High School opened on the Rinaldi campus (across the street from the Mission complex) with 456 students. It remained co-instructional in nature. Though small in numbers, Alemany had a great spirit that attracted others. By 1959 the student body numbered 1,000. In 1970, Alemany High School became co-educational with the integration of the boys and girls divisions. During the 1980s and 1990s, Bishop Alemany High School grew in numbers and stature. The history of Bishop Alemany is filled with examples of a determined spirit triumphing over unfavorable odds. In February 1971 the Sylmar earthquake severely damaged the chapel and other campus structures. With the united support and effort of the Archdiocese and the Alemany community, the school quickly resumed after repairs. Some twenty years later, the powerful January 1994 Northridge earthquake completely destroyed the structures of the Rinaldi campus. Like a phoenix, however, the Alemany spirit remained strong and rose from the disaster. After the Northridge earthquake, Bishop Alemany High School was relocated across Rinaldi Street to the campus of Our Lady Queen of Angels Seminary. 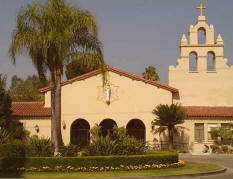 In the summer of 1995 Queen of Angels Seminary closed and Bishop Alemany High School remained; once again “situated in the shadows of the Mission”. At its present location, Alemany is the largest school in the Archdiocese of Los Angeles. It is a campus reflecting the beauty of nature, and symbolic of the planting and nurturing of the seed of knowledge occurring in the classrooms. Today, Bishop Alemany High School is thriving, boasting a racially and culturally diverse student body of about 1,520. As numerous alumni before them, today’s students strive to continue a proud tradition being of service to the community, being “a people dedicated to service”, while also excelling academically. This tradition of excellence manifests itself in a full Honors and Advanced Placement (AP) curriculum in addition to a strong college-preparatory program; 98% of our graduates go on to college.